Time to get excited: we now have an official reveal date for the new BMW M5. The wait is nearly over. 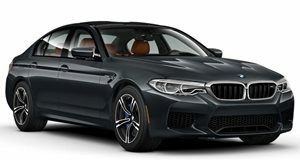 At the Frankfurt Auto Show this September, the all-new BMW 5 Series line-up will be completed as the automaker will finally lift the wraps off the new M5 to the public. However, we’ve known for some time that BMW will be revealing its new tire-shredding sedan ahead of the show this summer, either online or at a BMW-sponsored event. Sources suggested that the new M5 will be shown off this month, and now we have an official reveal date thanks to a teaser video posted on BMW’s social media accounts. We presume this is referring to the new M5 potentially being the fastest accelerating BMW of all time thanks to its 4.4 liter twin-turbocharged V8 engine rumored to pack 600 horsepower. As a result, the new M5 will reportedly accelerate from 0-62 mph in under 3.5 seconds. Power will be sent to all four wheels through an eight-speed automatic, which will be the only transmission option. We know, a BMW M5 without a manual sounds sacrilegious, but at least purists will be able to switch to rear-wheel drive on the fly. More will be revealed in just under a week’s time on August 21. We can hardly contain our excitement.